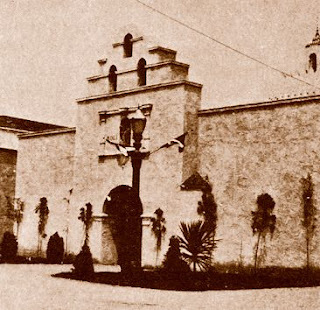 Located on the north side of the Pacific Southwest Exposition's Avenue of Nations, across from the Guatemala Building, the Bolivia Building was designed in the style of an old colonial mission church; and entered through a deeply arched portal, topped with a belfry. 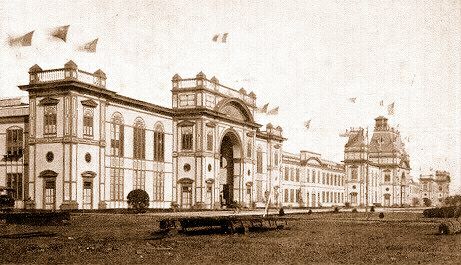 The exhibits within the building consisted of relics of the ancient Incas, Vicuna robes and Alpaca textiles, Spanish-Colonial coins, oil paintings, musical instruments, solid-silver vessels, decorated pottery, and an array of Indian arts and crafts. A large display of minerals, medicinal plants, and agricultural products was also shown. A large map explained the principal regions of the country, and numerous placards contained information about the many tourist attractions to be seen in Potosi, Sucre, and La Paz.